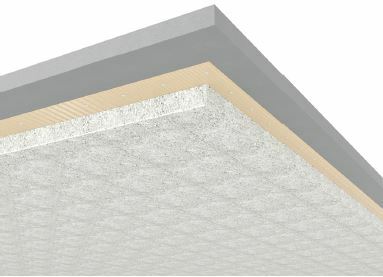 Projiso offers an innovative solution based on the spraying of Fibrexpan®, which improves acoustic insulation between superimposed spaces. Attachment of an expanded metal sheet with a paper covering to the concrete slab. Spraying of one or multiple layers of Fibrexpan® to the desired thickness. The following table of acoustic reduction values Rw+C for a raw concrete slab and a slab covered with varying thicknesses of Fibrexpan® coating installed as described above. Example: A system composed of an 180 mm thick slab sprayed with 150 mm of Fibrexpan® installed as described above will have an acoustic reduction of Rw+C = 63 dB instead of 59 dB for the raw slab. These values were obtained by calculations based on laboratory tests. Depending on the construction site and the installation conditions, on-site results may differ slightly. Acoustic reduction can be further improved. Please contact the Projiso technical department for more information.